Raw milk farmer and course leader Michael Schmidt talks with supporters at a news conference. For those who have completed the Basics workshop, Cowshare College – Level II is a half-day workshop on Saturday, June 18, 2011, from 9 am to 1 pm, which is the final training step in the credentialing process for producers who wish to be on Cow Share Canada’s referral list. At this session, more advanced material will be presented for a deeper understanding of cowshare programmes and the health and safety components involved. Participants will have an opportunity to bring specific questions and challenges to the session for discussion. To register for Cowshare College – Level II, email the appropriate form (attached) to csca@bmts.com or arc@bmts.com and put “Cowshare College – Level II” in the subject line. (Note: the Level II workshop is limited to those who have already completed the basic workshop). Includes a half-day of instruction and round-table discussion led by Michael Schmidt, tour of a raw milk dairy operation (optional) with question period and refreshments. Participants must have completed Canadian Cowshare College – The Basics before attending. We strongly recommend that participants also complete the independent inspection. Michael Schmidt has defended public access to healthy foods for almost two decades. 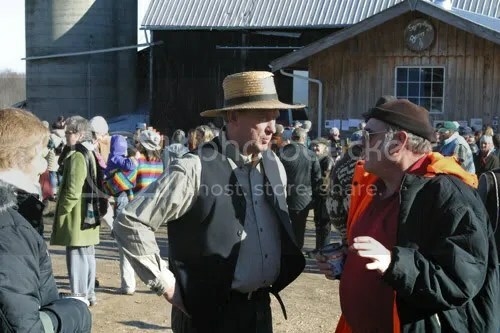 He has been the lightning rod in two major “Milk Wars” with local Boards of Health and the provincial government, spurred on by powerful industrial farming interests, and has successfully defended the rights of cowshare programme members to consume locally produced milk, produced specifically for direct consumption. He has a Masters in Agriculture and more than 25 years’ experience in biodynamic farming. Currently, he is involved in the rescue of a British Columbia cowherd operation, ordered to shut down by government officials. Michael founded Cow Share Canada early in 2010, to establish a grassroots infrastructure that could connect consumers and producers. Identification of issues, challenges and successes with participants’ cowshare/herdshare programmes in the planning and execution stages. Download application form below as pdf file here. Workshop fee is $150. Cheques should be payable to Cow Share Canada. Payment is due on or before the day of the session. Session may be cancelled if there are too few participants. I attest that I am not working as an agent for any government, that I will use the information I have access to strictly for my own purposes and that I will not share this information. note: if this sent electronically, we require an electronic signature or we will require you to sign at the session. Download above application form as pdf file here. I am looking for raw milk source. How can I get a membership?